The Council own and manage a number of piers and harbours and as a Statutory Harbour Authority comply with the Port Marine Safety Code. In addition there are 17 aids to navigation situated throughout the marine infrastructure that comply with the IALA standards. The piers and harbours throughout Argyll and Bute see a lot of activity throughout the year in various forms. This is both through commercial and leisure. Due to our location one of our main industries is fishing and transportation of goods via the sea. There are charges therefore for several things such as the shipping of goods, vehicles and passengers, storage and harbour vessel fees. There are many passenger ferries that pass throughout our ports and harbours and you can find the sailing times and prices here. Oban Harbour Development Group consists of key stakeholders, who are responsible for the development and operation of marine activity in Oban Bay - you can find out more and read minutes of their meetings on the Oban Harbour Development Group page. Campbeltown Harbour is a commercially flexible port at the southern tip of the Kintyre peninsula. The Quays and Marina accommodate fishing, cargo, timber, leisure and cruise ships, with modern facilities, storage and 24-hour CCTV. The Marina has 54 berths offering a flexible layout. Ferry services run to Ardrossan, Islay and Ballycastle, Northern Ireland. A hidden gem nestled on the East coast of the Kintyre peninsula, Carradale Harbour and Pier is mainly used for fishing and leisure purposes. Looking out towards the Kilbrannan Sound towards Arran, this picturesque little harbour lies only 15 miles from Campbeltown, with beaches, food and drink, accomodation and facilities all within walking distance of the harbour. Craignure Pier on the Isle of Mull is the arrival point of the Calmac ferry from Oban, and is a short drive or bus journey from Mull's main town, colourful Tobermory. Mull is famous for its diverse wildlife, spectacular scenery, and a rich cultural history, and you can easily cross from Mull to visit the islands of Iona and Staffa. Dunoon Pier is a famous local landmark in the centre of the town, with its iconic Victorian Pier, recently renovated to bring it back to its former glory. Argyll Ferries run the passenger ferry service to Gourock, connecting to the train link to Glasgow. Oban North pier, and the newly opened North Pier Pontoons, are right in the heart of Oban town centre, with easy access to road, rail air and ferry links to the mainland and the Inner and Outer Hebrides. 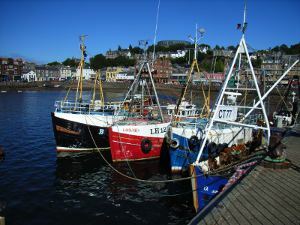 Nearby is Oban Harbour, a busy working port with modern, versatile facilities for a variety of users. Regular ferries have given Oban its title of the Gateway to the Isles, with easy connections to Mull and many other islands. Picturesque Port Askaig Pier connects Islay to Kennacraig and Oban on the mainland, and the islands of Jura and Colonsay, with regular ferries from the Calmac terminal.Visitors to the Isle of Islay can enjoy its eight working whisky distilleries, and fabulous scenery, seafood and birdlife all within easy reach of the pier.